That's a loaded question, but we may be able to help you find the answer. And now a great tour has gotten even better! We have 19 people committed to the tour, we only need one more and everyone saves $500.00! Come on, we created this tour especially for you. Check out this itinerary, custom designed with the piano & music lover in mind. If you aren't already signed up, go here for the details and join us for the piano and music lovers tour of a lifetime, and please bring someone to share it with if you can. If you are signed up already, great, can't wait to meet you in Germany. 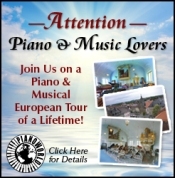 Piano & Musical Tour - Europe 2011 Click Here Now! We are still collecting details about places to hear live piano music. Restaurants, Piano Bars, Clubs, etc. If you know of any we can add to the list (thread) please post the details in this thread. On Saturday 5/3/2011 at 9 pm (italian time), "Martha Argerich Presents Project" makes its debut in Italy at Teatro Miela of Triest! "Martha Argerich Presents Project" wants to support music and promote artistic collaboration among musicians of different age, background and professional studies, and Martha Argerich is the Artistic Director of this important project. This concert is "Baires", a journey through argentinian atmosphere, from folk songs to old and new tango, with Daniel Rivera, Gabriele Baldocci, Riccardo Radivo, Chiara Della Porta, Enrico Fagone, Barbara Luccini and Lyda Chen Argerich! Music: Guastavino, Piazzolla, Villoldo, Rivera, Ginastera, Aguirre, Gardel, Bacalov, Ziegler, Donato. Bridging the gaps between old and new, Michael Kirkendoll is one of the most exciting pianists of his generation. His musical tasting menu will include works by Scarlatti, Beethoven, Ligeti, and living composers. Poets and pianists inspire each other with performances of contemporary music and writing, featuring pianists Ari Brown and Mabel Kwan, and poets Reginald Gibbons, Christina Pugh, Ed Roberson, and Rachel Jamison Webster. Co-sponsored by the Poetry Foundation. Pat & Micheal, over the course of the past year, have overcome any & all obstacles presented to them in having a secure location for their historic collection/study center. They are now able to devote their time into what they enjoy most; the beautiful period instruments made available to the public & the spring & fall concerts. If you happen to be in the area or live within driving distance to Ashburnham, MA, I highly recommend taking the opportunity to be in attendance for a concert. There is nothing quite as elegant as hearing a period instrument being played by one of the many artists who have appeared at concerts and who understand the tonal qualities these lovingly cared for instruments can produce. When Is a Porch Not a Porch? When it's a music room. As many of you know I've been working on converting the screen porch on my mobile home down here in Florida to a music room for a while now. Considering how hot it is here for a major portion of the year, the screen porch was pretty much useless to me. Because the porch was added on to the front of the coach (they call a mobile home a coach) after the fact, the wall between it and the coach was an outside wall, complete with aluminum siding, sliding glass doors, and Florida (wind out) windows. Our best single month Numbers Ever! December 2010 turned in our best traffic numbers ever. Year over year our traffic just continues to build. One interesting number that's not listed in the post (link below) is outbound clicks. That's because until very recently we didn't have the capability to measure them. Turns out in one week (Feb. 28 - March 6, 2011) we had 34,293 Outbound Clicks. What is a Piano Forums Piano Party? It's when members get together with other members (and their non-member spouses/friends/neighbors) to share their common bond - - the piano. Most piano parties are held at a members home. Typically everyone brings something to the festivities (food, drink, etc.). And everyone takes turns playing the piano(s). Pictures are a must! We love to see pictures and hear the stories. And while you are checking things out, check out our Fun Stuff category. Most of the posts in here are off topic, but they're fun! Do You Own a Dog? Could You Help My Daughter? My daughter is working on a degree in animal behavior (taking 3 classes and maintaining a 4.0 average), while she works full time running her own pet care / dog walking business. As part of her degree program she has designed a questionnaire about dog behavior. If you have (or had) a dog it would be a big help to her if you'd take a few minutes to take her survey (and a favor to me). Please note, if any piano manufacturers or other businesses are mentioned in this section, they did NOT pay for the mention, I just found the stuff interesting and wanted to share. By the way, we are working on holding another Cape Cod Piano Forums Party this year, probably in October. Hoping to combine it with a tour of the Mason & Hamlin Piano Factory. Know of a Good Thread? By the way, to find some of the threads for the above listings, I simply visited the Active Topics for Past 48 Hours link ( Active Topics - 48 Hours ). You can easily check out the Active Topics or Active Posts for the past 24 hours, 40 hours, or 7 days. You can even look at just the posts that haven't been answered. Interested in a Thankless Job with No Pay? Then have we got a deal for you! We're looking for a few good Mods (moderators) to help out our current team. You have to be tolerant, thick-skinned, not bring your own agenda into moderating, and be willing to keep an eye on posts in the forum(s) you are assigned. Yes, you can ask for a particular forum but there are no guarantees. We have to assign moderators where they are needed. Although we can't pay you, there is the satisfaction of knowing you are helping to keep the forums running smoothly, and most members really do appreciate your efforts even if they don't tell you so. We've opened the new version of our online store, cleaner, neater, easier to navigate, and with more goodies. To Celebrate we want to give you 10% OFF every product in the store! Looking for Piano Posters and/or Art? Whether you need local, national, or international coverage, we can help. If you no longer wish to receive the newsletter, remove instructions are at the bottom (but please give it a chance first, we'd hate to see you go). 57,000+ Forums Members, Over 1.6 Million Posts, and still growing!